Jobs - Faringdon Community Website. If you are a local business and have job, trainee or apprenticeship, or work placement opportunities, please use the Contact Us form with job details, suitable candidate information, start and end dates and contact information. It is free to advertise on this page. Maybe you are a voluntary group or organisation who can provide a young person some invaluable experience that will help them get a paid job. This is a great opportunity for a part time Administrator/Bookkeeper to join a local firm of builders. The role will require someone to be hands-on in all aspects of office administration, bookkeeping and payroll and also be happy to work at times on their own in the office in a village location. Candidate Specification: Organised, quick learner with a high level of accuracy. Excellent communication skills both written and verbal. Experience with MS Office applications. Experience of QuickBooks accounts software and payroll. Experience of the Construction Industry Scheme would also be an advantage. This is a permanent position with flexible working hours (Mon-Fri) of a minimum 18 hours a week. Please send your CV to alison@absgeneralbuildersco.uk. Closing date for applications 17th May 2019. Part-time, approx 8 hrs per week, £12 per hour, Self-employed/Freelance, flexible. 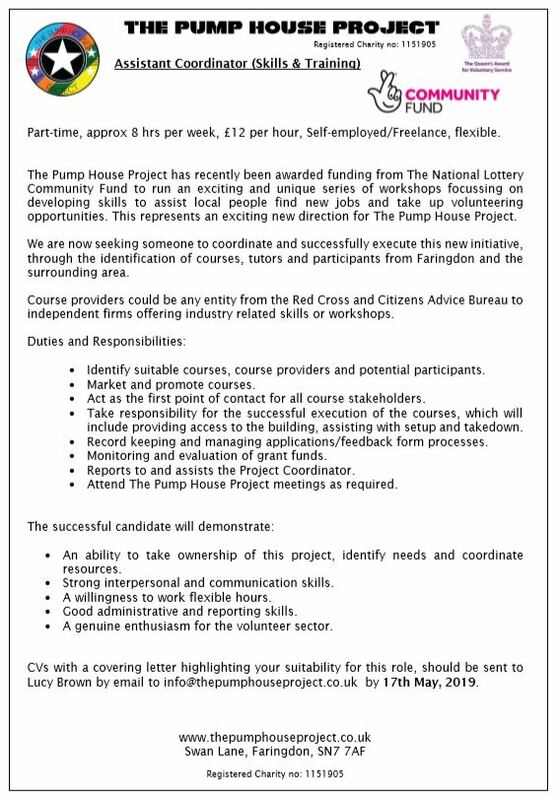 The Pump House Project has recently been awarded funding from The National Lottery Community Fund to run an exciting and unique series of workshops focussing on developing skills to assist local people find new jobs and take up volunteering opportunities. This represents an exciting new direction for The Pump House Project. We are now seeking someone to coordinate and successfully execute this new initiative, through the identification of courses, tutors and participants from Faringdon and the surrounding area. Course providers could be any entity from the Red Cross and Citizens Advice Bureau to independent firms offering industry related skills or workshops. CVs with a covering letter highlighting your suitability for this role, should be sent to Lucy Brown by email to info@thepumphouseproject.co.uk by 17th May, 2019. We are seeking full-time and part-time Care Assistants who can provide person-centred care to clients in Faringdon, Oxfordshire. First City Nursing and Care are an outstanding domiciliary care provider wanting new carers to join our team on the outskirts of Oxford. No experience is required for this role as comprehensive induction training is offered free of charge to all successful candidates. Whether you are looking for full-time work or an extra income we offer both full-time opportunities and shift work. Carpenter / Kitchen Installer - designer available for immediate work due to a further delay with a recent project. All about apprenticeships and real opportunities. Search on location and the type of work. Become a Good Neighbour Volunteer! Wantage Independent Advice Centre provides services across the Vale of White Horse. We're currently looking for volunteers in Faringdon to expand our services here. We're looking for Good Neighbour volunteers, to be matched with an older client in the neighbourhood for some regular one-to-one social time for around one hour a week. Could you befriend someone facing loneliness, and offer a little extra support? Contact recruitment@wantageadvice.org.uk or call 01235 763862. Wantage Independent Advice Centre provides services across the Vale of White Horse. We are currently looking for drivers to help us expand our Faringdon service, supporting our older clients to get to appointments at doctors, day centres, clinics, and hospitals. Flexible opportunity - you offer as much as you can give! Do you have a car and like making people feel comfortable? Contact recruitment@wantageadvice.org.uk or 01235 763862. A host helps library staff plan and deliver fun and interactive sessions involving rhymes and simple stories for children under 5 and their parents/carers. - to transport clients to and from Faringdon Day Centre, starting September after current OCC transport finishes. We meet every Monday and Thursday, but if you can help only one journey on one day/week we would still love to hear from you. which you can use for life. level-headedness required to make instant decisions. Do you want to help in providing a valuable service to the community? If the answer to any of these questions is “yes” then why not join the Faringdon Community Bus team which needs more volunteer drivers? The bus is straightforward to drive and full training will be given. Although welcome, no significant commitment is required, maybe only 3 or 4 mornings a month. CAB wants to provide a full day advice service in Faringdon and potentially a Saturday. To do this they need a volunteer from Faringdon. All training is provided. Always need Volunteers for their multitude of activities Please email info@thepumphouseproject.co.uk for details.